A waterless wash for motorcycle plastics! S100 Special Surfaces Cleaner is a streak-free, waterless wash that cleans plastic windshields, face shields, visors, instruments and fairings. Wipe away bugs, rain spots, and road film instantly. Every motorcycle should have S100 Special Surfaces Cleaner in its saddlebag. S100 Special Surfaces Cleaner is safe on all plastics, including polycarbonate, acrylics, Lexan®, Lucite®, Plexiglas®, and fiberglass. Spray and wipe to leave a clear, clean, anti-static surface that repels dust. This plastic cleaner works in seconds and leaves visors and windshields looking nearly invisible. S100 Special Surfaces Cleaner is formulated just for motorcycles. The plastic surfaces on motorcycles are prone to getting dusty and dirty because they’re open to the elements. S100 Special Surfaces Cleaner is a quick solution to clean all plastic motorcycle components safely and effectively. S100 Special Surfaces Cleaner is perfect for touring. Put a bottle and a towel in your saddlebag for quick cleaning any time, anywhere. The pump spray bottle doesn’t leak We recommend a Cobra Microfiber Towel to clean plastics because the soft threads will not scratch. S100 Special Surfaces Cleaner is intended for plastics but it is safe on paint and metals, too. Overspray is not a problem. 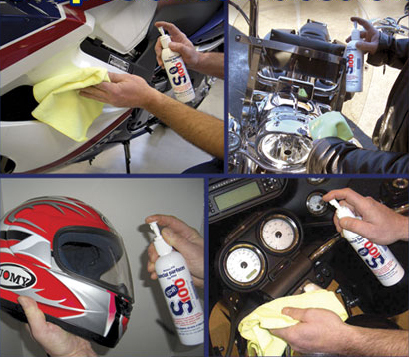 S100 Special Surfaces Cleaner is the perfect quick wipe-down for your motorcycle’s plastic surfaces. Take it anywhere to clean clear and colored plastics in seconds. I was looking for a cheaper alternative to Plexus for cleaning windshields and face shields. I bought the the S100 and some microfiber cloths. The S100 seems to work OK but it takes a lot of rubbing to get the streaks out. I have not used in humid/wet conditions so I do not how it will react to water and vapor as far as fogging if you use it clean the inside of a face shield. ConsHard to remove all streaks. Bought it for the Motohome too! This stuff worked so easily to get the yellow bugs off my windshield and my mirrors that I bought it for the front of my 40 foot motorcoach. In the past I have used Dryer Sheets which actually wok to some degree for the front of my motorcoach but this stuff was like a miracle! Cant recommend it too much! Youll love it.just spray it on a microfiber cloth and wipe the windshield or whatever and the bugs and gunk are gone.no runs, no drips, no errors! I use the cleaner on helicopter bubbles and it works great!